Over a period of five years, Seefeel’s Mark Clifford and Mira Calix irregularly got together to make music, with the intention to get back to the recordings at some point and finish them. Due to respective commitments, they were never able to complete the project at the time. With Andrea Parker showing great interest in releasing the result of this collaboration on her new label, Aperture, the pair reconvened some years later but found that the technology used to record had moved on considerably, leaving them with no real possibility to finally get these completed, and decided to present a selection of thirteen recordings in their raw state. The result is unavoidably somewhat uneven, with some tracks feeling more achieved than others. 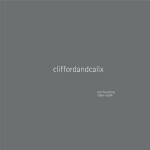 Both Clifford and Calix have been producing music that goes well beyond the realm of electronic music to encompass treated guitars and voices and electro-acoustic experiments. Bringing these under one umbrella was never going to be a straightforward operation, but, despite the sketchy nature of these tracks, there is a undeniable split of functions here. Clifford’s highly recognisable textural processing, which has tinted the sound of Seefeel, Disjecta and his collaboration with Calika, is felt throughout. Calix’s contribution consists essentially it seems of vocals which are in turn buried deep in the mix, heavily treated or left almost uncomfortably bare, but there are on closer inspection many manifestations of the glitch-ridden micro-soundscapes and decay that defined her early work and give these tracks some added grit. Working essentially from torn electronics and distortions, with only occasional beats to reinforce the fragile structures, Clifford and Calix build here an unlikely assemblage of sounds and noises to support Calix’s naïve little songs. This occasionally works pretty well, on album opener Someone Like Me for instance, on which the voice, fairly untouched, is put in sharp contrast to the distorted backdrop, on the ethereal You And I, on the sweet and sour Dream Of You. All too often though, the unfinished nature of these tracks gets in the way of the effect intended and end up lost slightly, as is particularly the case on Beethaven, Alkaline or One 2 Far. Each one of these originally promises but never quite delivers, lost in an untidy cloud of sounds on the former, or in unnecessary loops in the latter two. Concluding Lost Foundling are the rockier He Promised It All and In Her Room, separated by one last short burst of electronics. Sitting at odds with the rest of the record, these two pieces not only feel totally out of place, but seriously erode the fragile balance which previously maintained the integrity of the project. On paper, this collaboration between two radically different artists driven by a similar taste for experimental electronic music is a very exciting offer. One can only hazard a guess to how these tracks would have eventually developed, but as it stands, in its unfinished form, Lost Foundling is too much of a patchy collection to entirely convince, yet it contains enough great moments to salvage it.